Dandelion's Home School Reading Books Teach Young People How To "Wake Up" And "Think"
Home school reading may never have been Dandelion author, Norman D. Livergood's intention when he first starting writing books. 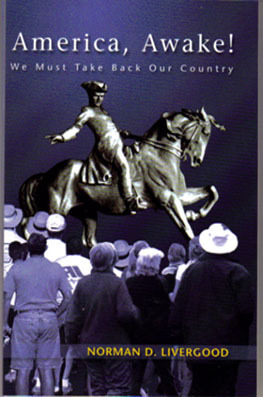 “This book is intended as a wake-up call for Americans, as Paul Revere awakened the Lexington patriots to the British attack on April 18, 1775, and as Thomas Paine's Common Sense roused apathetic American colonists to recognize and struggle against British oppression. “Our current situation is similar to that which American patriots faced in the 1770s: a country ruled by ‘foreign’ and ‘domestic’ plutocratic powers and a divided citizenry uncertain of their vital interests." America, Awake! and three other Norman D. Livergood titles published by Dandelion present a comprehensive set of home school reading textbooks for students of high school age. The Livergood books teach young people how to become more aware, organize their thoughts and enrich their intellectual power base with words of wisdom from the great teachers of the past. “Worldwide, thinking people are faced with the terror of the demonic cabal controlling America and the world. "This cabal has corrupted and contaminated the old culture to the point that if we locate our primary being in that culture we'll become as insane and corrupt as they. We have no other recourse than to realize a new culture,” write Livergood and Mairesse. Dr. Norman D. Livergood is an author, publisher and information consultant living in Vista, California. He serves as adjunct professor at the California State University, San Marcos. He has a bachelor's degree from Phillips University, a masters' doctoral degree in philosophy from Yale University and a second doctorate in artificial intelligence from the Union Institute. In 1993 through 1995, he served as Professor and Chair, Artificial Intelligence, at the United States Army War College. Dr. Livergood has carried out extensive research and published in the fields of artificial intelligence, political-economic philosophy, intelligent tutoring systems, and distance learning. He is Webmaster of his Internet site, Hermes-Press.com.